Each node of LeoStorage, LeoGateway and LeoManager provides a built in SNMP agent which allows to connect external systems, such as Nagios and Zabbix. You can retrieve various statistics of your LeoFS. SNMPv2-SMI::enterprises.35450.15.1.0 = STRING: "[email protected]"
iso.3.6.1.4.1.35450.56.1.0 = STRING: "[email protected]"
SNMPv2-SMI::enterprises.35450.34.1.0 = STRING: "[email protected]"
In order to easily monitor LeoFS, we provide LeoFS' input plugin of Telegraf1. See more details on its documentation. 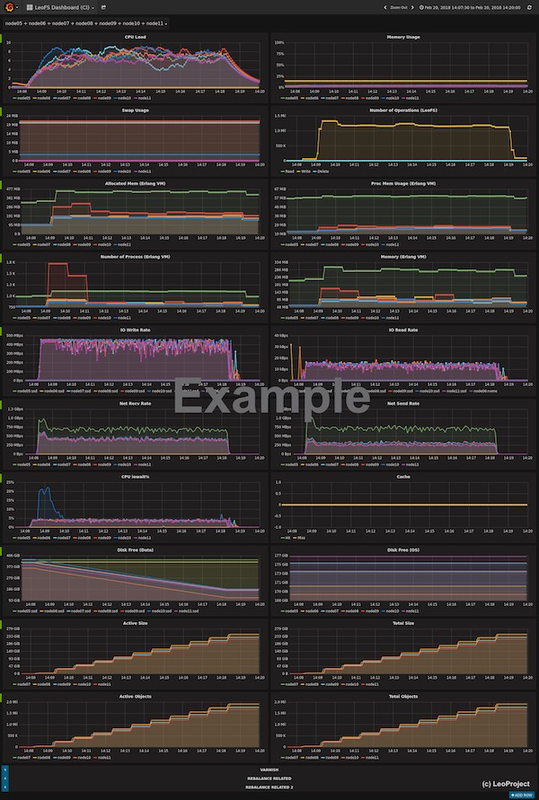 If you decide to use Telegraf1 as LeoFS' monitoring agent, you need to install InfluxDB2 and Grafana3. We provide another way of LeoFS system monitoring which uses Prometheus 4 and SNMP-Exporter 5, and deliver snmp.yml of each component (LeoGateway, LeoManager, and LeoStorage) so that you can easily start. See more details on SNMP-Exporter's documentation. If you decide to use Prometheus 4, you need to install Grafana 3 and SNMP-Exporter 5 to LeoGateway nodes, LeoManager nodes, and LeoStorage nodes respectively.